Hillside Haven avec vue sur l'océan, Minutes to Shore Beach de Cousin! Aéré et lumineux, le gîte offre un endroit pour rafraîchir votre corps, rajeunir votre esprit et restaurer vos sens. Passez la journée à vivre les plaisirs de la PEI et revenir à votre maison loin de la maison. Le balcon de la mezzanine est un endroit idéal pour profiter de la vue et regarder les colibris dansent. 6 personnes confortablement. La chambre principale, au deuxième étage, dispose d'un lit queen size. Une deuxième chambre, à l'étage principal, dispose de deux longs lits jumeaux qui peuvent être convertis en un lit king size. Le loft a un lit gigogne et deux canapés tirer aussi en lits doubles. La cuisine est entièrement équipée avec un service pour huit (même un pot de homard). La salle de bain dispose d'une baignoire à 6 pieds. Le chalet est entouré par deux acres de pelouses et de jardins. Profitez d'un jeu de boule de pétanque ou de croquet. Really nice house, well located! Janet and Dorothy were so kind and handsome with my father and I, thank you! PEI is wonderful, hope to visit soon again! 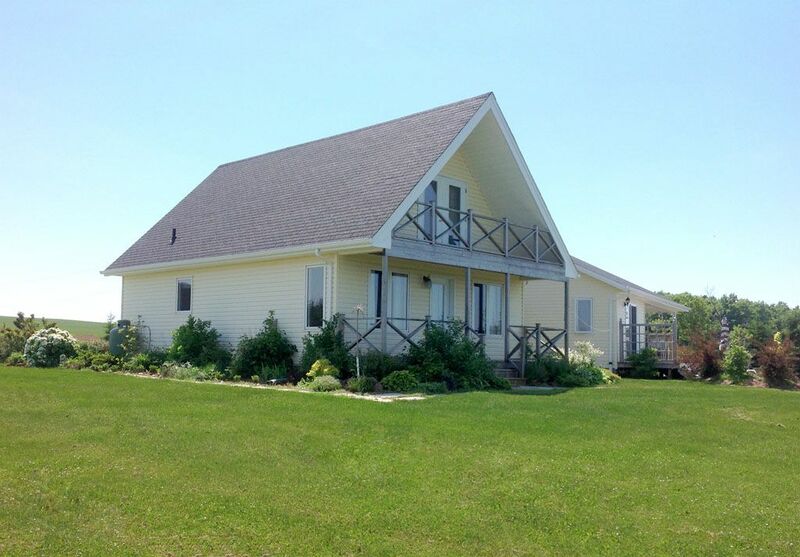 Janet's cottage is a wonderful, clean and well maintained property in the heart of PEI. All major attractions are nearby. Loved the beaches, little harbors and of course seafood! Janet is a lovely and caring host and we will be back. We stayed for a week (2 adults and 4 teenagers). Lots of space for everyone. Janet was super friendly (she lives next door), and was always there if we needed anything! Cottage was on top of a hill with a view of fields and trees. Super quiet place. Lots of hummingbirds to keep you company while you sit on the porch. House was super clean, and had everything that we needed! We loved every second of it and would definitely stay here again!!! We are a family of four. Stayed for four nights and had a great time. The cottage is located close to the beach, but outside of the main touristy areas. There was plenty of space around the cottage for the kids to play. Highly recommended. A slice of heaven right here on earth! Do you ever long for the days when a simple conversation warmed your heart? When people were real? When your host truly strived to make your vacation extra special? A few days in this beautiful place was one of the most warm and refreshing experiences ever! Our host Janet has hospitality down to an art form. We had a very late arrival yet she was there to greet us and had even stocked the fridge with breakfast items since we wouldn't have been able to shop. That is not anything we would have expected. This cottage was perfect for our family of five and we immediately felt right at home. The setting is idyllic and everything felt fresh and new. It was a great launching pad for all the beauty Prince Edward Island has to offer. It is out in the countryside with the most beautiful view of rolling hills and the ocean. The cottage is perfectly appointed with absolutely everything we could have needed. The privacy of early morning coffee with the birds singing and the spectacular views was more than refreshing. So peaceful! If we could award this place more than 5 stars we wouldn't hesitate. Janet was wonderful and took great care to see that our PEI experience was extra special with so many personal touches. We would HIGHLY recommend this hillside haven and hope to return one day. Thank you Janet! OMG thank you. You are a lovely family and it was my absolute pleasure. While we enjoyed this cottage, it should be noted in the ad that the cottage is actually ATTACHED to to the owners house and shares a driveway. The owner was lovely but we did not appreciate the lack of privacy. We do have two units that are separated by a storage room. We are very respectful of the privacy of all our guests and appreciate the same. Its unfortunate that you felt that way.